In-flight portrait of the Apollo 13 Environmental Control System. Apollo 13 was the mission that suffered an explosion in an oxygen tank in the Service Module, which led mission controllers to decide to use the Lunar Module (LM) as a lifeboat to return the crew to Earth. But because the LM lacked sufficient carbon dioxide scrubbing capacity for three men for the duration of the mission, carbon dioxide concentrations began to climb to toxic levels. The system used lithium hydroxide canisters to absorb CO2, as did the system in the Command Module (CM), but the two canister types were incompatible. 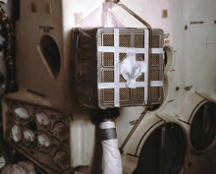 A team in Houston then improvised a means of using the CM canisters in the LM Environmental Control System, using only materials available on board. After verifying the scheme in simulation, they read their instructions to the crew, who then reproduced the improvisation in the spacecraft. The scheme worked. It was just one small part of the entire improvisational effort that returned the crew to Earth alive and well. Photo courtesy U.S. National Aeronautics and Space Administration. When executing a project, improvisation happens whenever we depart from the plan. Since most projects entail at least some small steps into unexplored territory, their plans are somehow incomplete or incorrect. When we discover the conflicts between a plan and reality, we halt and replan if we have time, and we improvise if we don't. We usually improvise. Here is Part I of a set of guidelines and insights that help make improvisational approaches more effective. Part II explores project improvisation as a group process. Part III addresses connections between project improvisation and risk management. This Part I examines the fundamentals of project improvisation. The defining characteristic of projects is that we've never done anything quite like them before. The inevitable surprises create a need to improvise. To view the need to improvise as either a defect in the plan or a defect in the planner is a critical error. Educate all concerned, in advance, that improvisation is a normal and natural part of project work. Attempting such education at the moment of need is counterproductive, because it seems like defensive rationalization. When improvisation begins, its effect on the parts of the plan in which we still believe are unknown. We have to take time to understand the full impact of the improvisation. While it's certainly possible that large portions of the plan can remain in place, the effects of improvisation can be subtle and unexpected. A thoughtful review of the entire plan is required. Some organizational cultures want to believe that improvisation has no place. Even when improvisation is happening, they deny its existence by calling it a replan. For instance, if six people revise in five days a plan that took thirty people six months to develop, can we seriously call it a replan? Such a revision is closer to improvisation than it is to replanning. We usually do better at whatever we're doing if we're willing to admit we're doing it. If you're improvising, call it improvisation, and do whatever it takes to make it the best improvisation it can be. admit we're doing itculture is already aware of project improvisation as a necessary and useful skill, it's likely that previous improvisations have gone unrecognized and uncontrolled. Performance might have been disappointing. Past performance can be misleading if it reflects uncontrolled, ad hoc improvisation. Distinguish such episodes from serious, coordinated, and thoughtful improvisations. Would you like to see your comments posted here? rbrenhGeMoBXXItDiTUWkner@ChacXxCjxtJFswWoXQeVoCanyon.comSend me your comments by email, or by Web form. I offer email and telephone coaching at both corporate and individual rates. Contact Rick for details at rbrenGnoktgCuqbhsreudner@ChaclshrRtAtSFlkQOJVoCanyon.com or (650) 787-6475, or toll-free in the continental US at (866) 378-5470.